A nice chip, but too expensive to be remotely relevant. 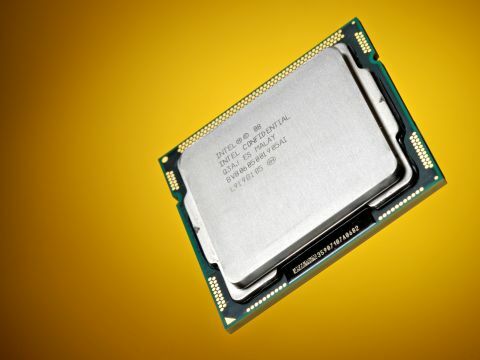 It's day zero for Intel's new mid-range processor, the chip codenamed Lynnfield. Available in both Core i5 and Core i7 trim, it's the latter we test here, specifically the top spec Core i7 870 model. The 870 is rated at 2.93GHz as standard, though Intel says with Turbo Boost enabled it can reach speeds up to 3.6GHz. In our testing, Turbo Boost never achieved more than 3.2GHz. But before we get to the performance nitty gritty, allow us to recap the specs of this new Core i7 beast. Despite the carry-over Core i7 branding, this is a genuinely new processor. It even requires a new socket, known as LGA1,156, and a new motherboard chipset, the P55. At the same time, it sports fundamentally the same 45nm processor architecture as the existing "Bloomfield" Core i7 processor, including monolithic quad-core layout, an integrated DDR3 memory controller and 8MB of L3 cache memory. All of which may have you wondering why Intel is even bothering with the new Lynnfield chip. Why not stick with the Bloomfield Core i7 with its LGA1,366 socket and avoid confusing poor old punters with two mutually incompatible Core i7 chips?